Rhian Edwards’s first collection of poems Clueless Dogs (Seren, 2012) recently won Wales Book of the Year 2013, the Roland Mathias Prize for Poetry 2013 and Wales Book of the Year People’s Choice 2013. It was also shortlisted for the Forward Prize for Best First Collection 2012. Her pamphlet of poems, Parade the Fib (Tall-Lighthouse), was awarded the Poetry Book Society Choice for autumn 2008. Rhian is also a winner of the John Tripp Award for Spoken Poetry, having won both the Judges’ and Audience award. Rhian’s poems have appeared in The Guardian, Times Literary Supplement, Poetry Review, New Statesman, The Spectator, Poetry London, Poetry Wales, Areté, Prague Revue, The London Magazine, Stand, Planet, New Welsh Review and The Lampeter Review. Rhian was the first Writer in Residence at Aberystwyth Arts Centre from March to June 2013 and at the G39 Gallery from January to March 2013. 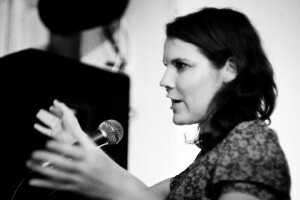 Rhian is a poet and musician and has delivered over 400 stage, radio and festival performances worldwide. She lives in South Wales with her husband Blake and their daughter Megan.